There are some things you simply must do when visiting the New Orleans French Quarter. The Jazz Brunch at The Court of Two Sisters is definitely one of them. The Court of Two Sisters is housed in a historic building dating back to the early 1700’s. The Jazz Brunch offers a beautiful outdoor courtyard setting, talented musicians just feet from your table, and a buffet that is a feast for both the eyes and the palate. We enjoyed every delicious minute! We asked Sales Manager Magan Adams to tell us more. How would you describe The Court of Two Sisters in one sentence? The only live jazz brunch offered 7 days a week in the French Quarter’s largest outdoor dining courtyard. What can you tell us about the history of The Court of Two Sisters? It was two Creole sisters and the notions shop they owned on this site that gave The Court of Two Sisters its name. However, 613 Rue Royale has long played a significant role in the history of the French Quarter and old New Orleans. Originally known as "Governor's Row", the 600 block of Rue Royale was home to five governors, two state Supreme Court Justices, a future Justice of the U.S. Supreme Court, and a future President of the United States. It is not surprising, then, that the original resident of our address was Sieur Etienne de Perier, royal governor of colonial Louisiana between 1726 and 1733. It has also been rumored that the outrageous Marquis de Vaudreuil, the colonial royal governor who transformed New Orleans from a marshland village into a "petit Paris", was once a resident of 613 Rue Royale. The two sisters, Emma and Bertha Camors, born 1858 and 1860 respectively, belonged to a proud and aristocratic Creole family. Their "rabais", or notions, outfitted many of the city's finest women with formal gowns, lace and perfumes imported from Paris. Marriage, reversals of fortune, widowhood - nothing could separate the sisters. Indeed, as the Picayune was to report, the sisters died within two months of each other in the winter of 1944. United in death as in life, the sisters lie side by side at St. Louis Cemetery #3. How would you describe your Dinner Menu? 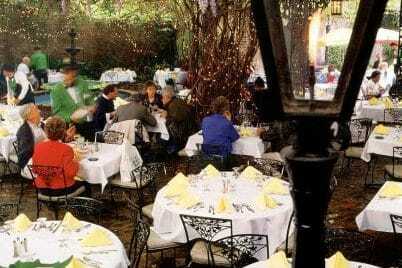 Enjoy a quiet, elegant Creole Dinner in our courtyard or in one of three indoor dining rooms. Explore a plethora of New Orleans favorites such as Trout Amandine, Shrimp & Grits, Turtle Soup Au Sherry and more. A La Carte and 4-Course Table d’Hote menus offered every evening. How would you describe your Jazz Brunch? Our Jazz Brunch Buffet is a sumptuous display of hot and cold dishes. We use only the freshest ingredients so the buffet's selections change according to season and time of day. In the morning, a typical selection of hot dishes includes made-to-order omelets, Eggs Benedict, sausage and bacon, grits and grillades, and shrimp and veggie pastas with a creamy Alfredo sauce. The afternoon's sampling includes Creole jambalaya, turtle soup, Crawfish Louise, Duck a l'Orange, and Shrimp Etouffee. The cold buffet is a creative sampling of boiled shrimp (and crawfish when in season) with your choice of traditional cocktail or Creole remoulade sauces, seafood and pasta salads, pates, cheeses and a variety of fresh fruit. Also included are delicious desserts: pecan pie, homemade vanilla ice cream, Bananas Foster and our famous bread pudding with whiskey sauce. While enjoying brunch, relax and sing along with our Jazz Trio, which plays daily. Who dines at Court of Two Sisters? The Court of Two Sisters is enjoyed by both visitors and locals alike. Our world-famous Jazz Brunch Buffet fits any occasion and parties of all sizes; our Creole dinners are perfect for a plethora of events from corporate groups to rehearsal dinners and wedding receptions. We enjoyed every delicious minute of our Jazz Brunch at The Court of Two Sisters! The Court of Two Sisters is located at 613 Royal Street, New Orleans, Louisiana. You can reach them by phone at 504-522-7261.